Here's a hint: If you're the cops are looking for you, don't post "Catch me if you can, I'm in Brooklyn" on Facebook. It seems like there is a particularly epic amount of stupid amongst criminals these days, based on the stories that keep popping up about how they're busted thanks to (or while they're still using) Facebook. There was that guy who tried to hire a hitman via a post on his wall. The one dude who kept updating his status after he took a hostage and was in a stand-off with police. Oh, and that criminal mastermind who posted photos of himself posing with the stuff he was stealing, mid-burglary. And now there's the evil genius who was taunted the cops by saying he was in Brooklyn. Spoiler alert: This guy got caught, too. Victor Burgos was being sought by Utica police; there were multiple arrest warrants out for him based on "domestic violence and harassment of his ex-girlfriend." 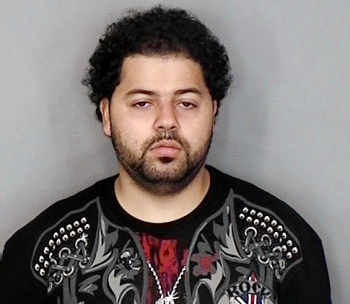 In fact, his picture was featured on the police department's website as one of the county's ten-most-wanted criminals. Apparently being featured on the website is what pushed Burgos to taunt the cops via his Facebook page. "Catch me if you can, I'm in Brooklyn," he wrote. Burgos also posted a video on Facebook of him walking into an NYPD stationhouse that was reportedly in Brooklyn. Unsurprisingly, a task force of U.S. Marshals and NYPD detectives tracked the young man down in an apartment he was staying in, and met his challenge. Then, he was draged back up to Oneida County to face a number of criminal charges. "He told us via facebook to come and get him and we did," said Sgt. Steve Hauck of the Utica police. Burgos claims to be a rap music promoter (under the name "R. Mack Milly"). Somehow, his upcoming prison stay doesn't seem like it'll earn him too much street cred, based on how embarrassingly stupid his arrest was.